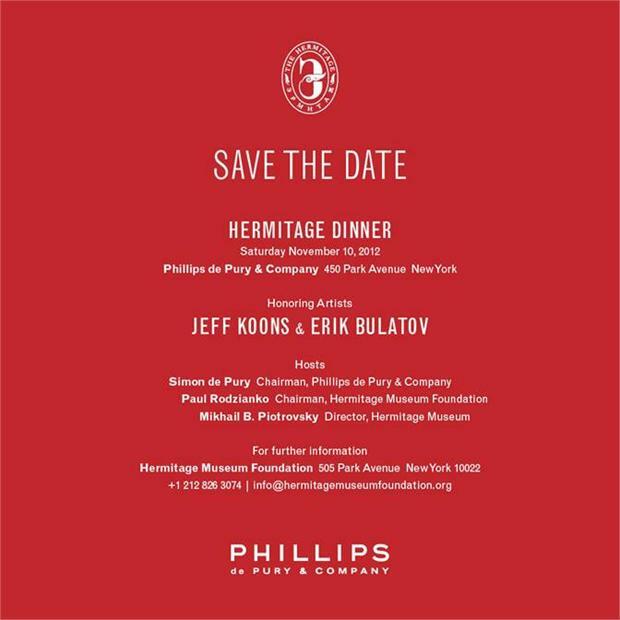 The Hermitage Museum Foundation has announced the date for the annual Hermitage Dinner – November 10th. This year the event will be hosted by Phillips de Pury & Company in New York. Jeff Koons and Erik Bulatov are the featured artists. Ten to fifteen important artist’s works (including Ingrid Dee Magidson’s) will be auctioned off to support the Hermitage Museum’s expansion and collection of post-war and contemporary American Art. If you would like to attend, please see the information below and call early. There is limited space and the event is likely to sell out. Proceeds from the evening will support the Foundation’s Art from America campaign, which aims to build up the Hermitage Museum’s collections and exhibition program of post-war and contemporary American art. The Museum’s Impressionist and Modern art collections will be displayed in the Museum’s new 20th and 21st century galleries of the General Staff Building, set to open on the occasion of the Museum’s 250th Anniversary in 2014. Other projects of vital importance to the Hermitage will also benefit, such as educational outreach, restoration projects and curatorial exchanges. This entry was posted in Hermitage Museum Russia, Ingrid Dee Magidson and tagged catherine the great, erik bulatov, hermitage, Hermitage museum, Ingrid Dee Magidson, jeff koons, new york, phillips de pury. Bookmark the permalink.